Eurobahn Talent approaches Neue Mühle station"
A northbound train arrives at Neue Mühle station. Because the state railroad wanted to close down this traffic, track maintenance left something to be desired for many years. Weed in the track shows, that it is in need for ballast cleaning. At least, it is outfitted with concrete ties, continously welded rail and tension clamping, as it has been the standard for several decades. High trees along the line might provide romantic looks, but tell a story of neglect as well. Railroads should stay in operation in any weather - their ability to do this is one of the reasons, to spend the taxpayer's money. 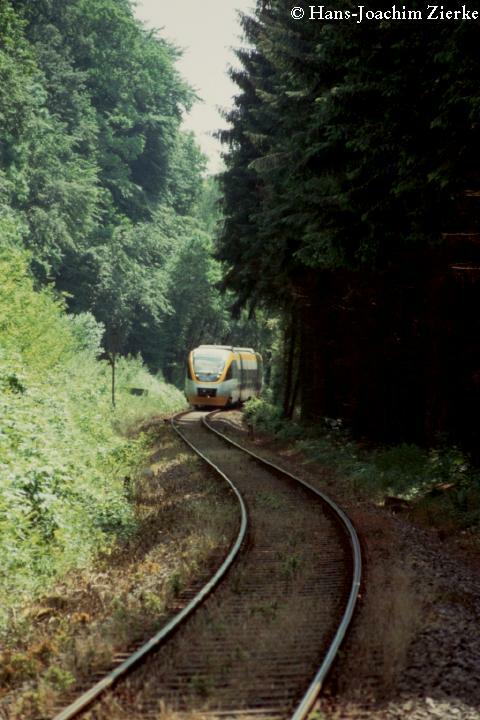 High trees along the track mean, that the operation is easily knocked out by major storms.